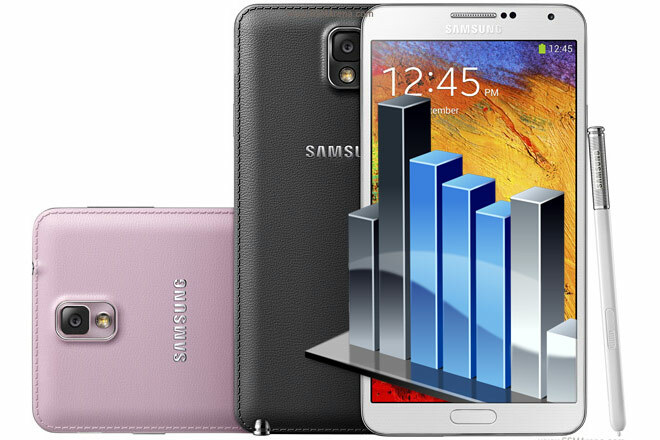 The Samsung Galaxy Note 3 is available in two different configurations – with a Qualcomm Snapdragon 800 chipset or with the company’s own Exynos 5420 Octa SoC. In our review, we tested the Snapdragon 800 variant of the phablet (N9005) and it nearly tops all of the benchmark charts. Now, as we got our hands on the alternative Note 3 version, we’re eager to see how it compares when it comes to performance. Prior to announcing the Galaxy Note 3, Samsung outed the updated Exynos 5420 Octa chip stating its 20% faster than its predecessor in the CPU department and nearly twice as fast in terms of GPU. This should give it a fighting chance against the heavyweight chip champion that the Snapdragon 800 is. Without further ado, here are the scores below. As you can see, things between the two versions are pretty close and on most benchmarks they are equal for all purposes practical. Yet where there are differences they are almost always in favor of the Snapdragon 800 Galaxy Note 3. Exynos 5420 only managed to prevail in AnTuTu 4, but lost in GeekBench and all the GPU tests. So while both Galaxy Note 3 versions are proper powerhouses, the Qualcomm Snapdragon 800 chipset has a slight edge in terms of overall experience. And while this is the kind of difference you probably won’t feel in real life, 4K video recording and LTE connectivity are also a couple of major weapons in the arsenal of the Qualcomm-powered Note 3. This leaves the Galaxy Note 3 with Exynos 5420 as a viable option only if you get a good deal for it.